Much more deserves to and has been said. For certain, globalization is enabling some people to become vastly richer while many more are made poorer. 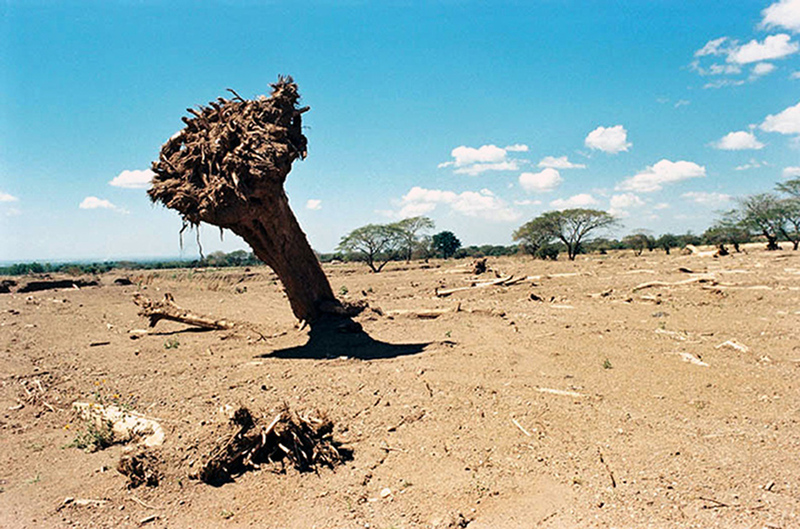 Under globalization, not only are people are being exploited; they are losing their lands and often their entire communities while the resources they depend on are stolen and exported–often irreversibly depleted from the Earth–contributing to climate change and in turn threatening all life support systems on this planet. Protesters tear down sections of wire barricades at the World Trade Organization (WTO) meeting in Cancún, Mexico. Moments earlier a South Korean farmer, Lee Kyoung Hae, 56 years old and father of two, committed suicide by plunging a knife into his heart while atop of one of the wire barricades. “The WTO Kills Farmers” became the dominant message of these protests. The WTO never fully recovered from the shut down of its ministerial in Seattle in 1999 nor the subsequent mass protests in Cancún in 2003. Their negotiations on agricultural trade were never able to move forward due to the unified opposition of developing nations, whose positions were supported by the protesters. Police in cloud of tear gas prepare to fire rubber bullets on protesters in Miami, FL who were demonstrating against the Free Trade Area of the Americas (FTAA) summit meeting there. After the major permitted march on November 20, 2003, police clashed with protesters on the streets of Miami. Police used tear gas, rubber bullets, electronic tasers and other less-lethal weapons to attack the protesters. Many protesters and bystanders were injured. An estimated 20,000 or more marched that day in Miami against the FTAA. Trade ministers from 34 countries had come to Miami to negotiate a new neoliberal trade agreement that would stretch from Alaska to Chile encompassing all of the Americas, except for Cuba. Mapuche men walk through a newly planted monoculture plantation of eucalyptus seedlings; the man on left steps on the seedlings. In Chile, plantations are concentrated on former farmland in the traditional territory of the Mapuche people in the Lumaco region. Plantations in Lumaco increased from 14% of the land in 1988 to over 52% in 2002. Chile exports 98% of its forestry products to the North and to Asia. Throughout the country over 2 million hectares of eucalyptus and pine plantations are controlled by only two companies. As a result of this farmland conversion, Mapuche communities are being forced onto poor quality lands where they are surrounded by plantations. Because the plantations are so water intensive, the communities must rely on water trucks from the end of spring until the beginning of autumn. The contamination of ground and surface water from the toxic pesticides and herbicides used on the plantations cause sickness. The heavy pollination from the pine plantations contaminates water, and causes allergies and skin problems. The expansion of the area of land occupied by plantations has been accompanied by a rise in poverty rates among Mapuche communities. In Lumaco, one of the poorest regions of Chile, 60% of the population lives under the poverty level with 33% in extreme poverty. A harbinger of the impacts of extreme weather caused by the climate crisis. This tree was uprooted and stuck upside down in the debris when the crater lake in the Las Casitas volcano collapsed during Hurricane Mitch in Nicaragua and caused a major mudslide. The land affected by the mudslide resembled a desert. The crater of Las Casitas volcano collapsed at 11 am on Friday, October 30, 1998, causing a mudslide that swept down the side of the volcano obliterating all in its path. Over 2500 people in small villages were killed at the onset and hundreds died afterwards. Nicaragua National Assembly Congressman and member of the Environmental Commission Jose Cuadra blamed Congressman Eduardo Callejas for deforesting the sides of the volcano in the 60’s and 70’s, destabilizing the slopes and contributing to the mudslide. Other sources say that Callejas also cut part of the forest 1997 for coffee production. Additionally he allowed telecommunication towers to be built on top of the volcano and a road built up its side, furthering the destabilization. Whistle blower Jose Cuadra was assassinated on August 18, 1999.